NASA Earth Observatory images by Joshua Stevens, using SMAP data courtesy of JPL and the SMAP science team and soil moisture network data from TAMU North American Soil Moisture Database. Caption by Kathryn Hansen. Compared to the amount of water stored elsewhere on the planet, the amount in the soil is minuscule. But that small volume has great significance around the world. Measurements of soil moisture are relevant for a variety of applications, particularly farming. There’s more to it, however, than the simple fact that plants need water to grow. Knowing something about the moisture in the soil is important before, during, and after the growing season. For example, will mud prevent a tractor from safely plowing through the fields? How much water will fruits, nuts, and vegetables have available at each stage of growth, from germination through harvest? What is the forecast for crop yields around the world? How will the amount of moisture and agricultural output affect trade policy and food aid? Satellite and ground-based sensors are helping scientists find out. The map above shows the amount of moisture in the top 5 centimeters of the ground across the United States. (The resolution is about 9 kilometers per pixel.) It was produced with data collected from May 27–31, 2015, with the radar and radiometer instruments on NASA’s Soil Moisture Active Passive (SMAP) satellite. (Note: the radar stopped transmitting data in July 2015, but the radiometer is still active.) Colors show the volume of water contained in a volume of soil. Dark green and blue areas are progressively wetter, up to a ratio of about 0.5; at that point, the ground is considered saturated. At the same time, ground-based sensors monitor soil moisture over small areas—typically less than one square meter. The second image shows the locations of more than 1,200 ground-based stations across the United States. Networks of ground-based stations have become expansive in the United States, particularly in Oklahoma. In that state, stations are part of an environmental monitoring network called Mesonet, which was conceived after a disastrous flood struck Tulsa, Oklahoma, in 1984. Today, more than 100 stations across Oklahoma measure soil moisture at depths down to 60 centimeters (24 inches). Mesonet is just one of 31 networks, which together account for nearly 1,500 stations in North America. Data from ground sensors, updated every 30 minutes, can help farmers quickly figure out where there is inadequate moisture in their fields. The plot below the map shows the level of detail provided by data from the Coastal Sage UCI station in California. These in situ networks do not cover all areas of the United States, and certainly not all of the planet. To fill in the gaps, some scientists estimate global soil moisture by running computer models loaded with precipitation, temperature, and humidity data. Gathering all of the data to run such models can take as long as two to three months, which makes real-time applications impossible. Through recent satellite missions, Moran and colleagues have been learning more about how soil moisture affects plant growth and agricultural productivity, especially during conditions of water shortage and drought. For instance, there have been drier and longer droughts than the one that has parched the western U.S. over the past four years, but no drought on record has been so hot. The combination of heat and the lack of water drove soil moisture to unprecedented deficits. Read more in our latest feature story: A Little Bit of Water, A Lot of Impact. Bolten, J.D. et al., (2009, December 15) Evaluating the Utility of Remotely Sensed Soil Moisture Retrievals for Operational Agricultural Drought Monitoring. IEEE Journal of Selected Topics in Applied Earth Observations and Remote Sensing , 3 (1), 57-66. Food and Agriculture Organization of the United Nations (2015) International Year of Soils. Accessed September 16, 2015. Lu, H. et al., (2009) Monitoring Soil Moisture from Spaceborne Passive Microwave Radiometers: Algorithm Developments and Applications to AMSR-E and SSM/I. Advances in Geoscience and Remote Sensing , Chapter 17. 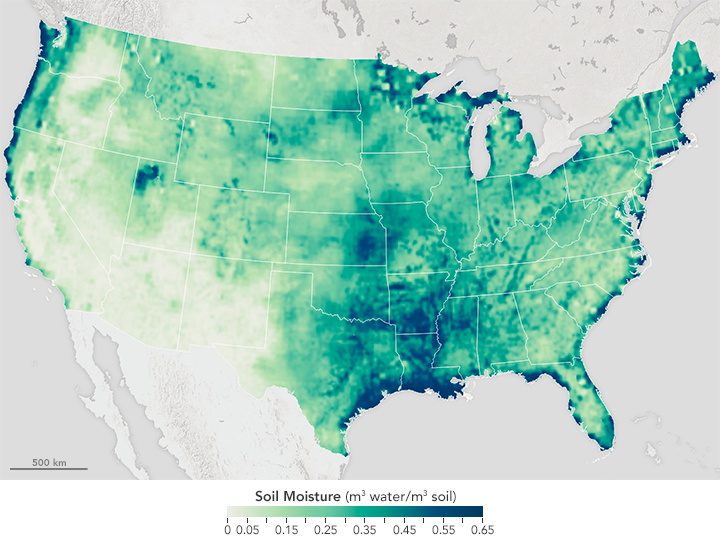 NASA’s Jet Propulsion Laboratory (2015) Soil Moisture Active Passive (SMAP). 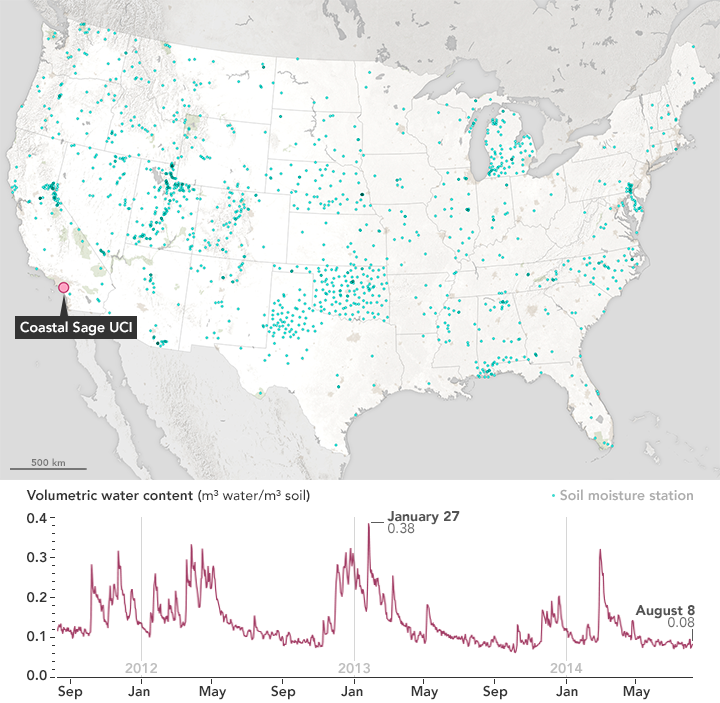 NASA’s Jet Propulsion Laboratory (2015, March 9) NASA’s Soil Moisture Mapper Takes First ‘SMAPshots’. Accessed September 16, 2015. SMAP (Soil Moisture Active Passive (2014, August 18) New Satellite Data Will Help Farmers Facing Drought. Accessed September 16, 2015. SMAP Mission Brochure (2014) Mapping Soil Moisture and Freeze/Thaw State from Space. Accessed September 16, 2015. United States Department of Agriculture (2015) Agricultural Research Service. Accessed September 16, 2015.